I'm using analog pin 5 on Arduino to detect presses from 6 push-buttons. On the picture top-right button is number 1 and then from right to left they go as 2, 3, 4, 5, 6. Program should print 0 when none of the buttons is pressed and if one of them is presses, it should print its position as I mentioned before. Currently the problem is that if I press say second button, it will (instead only once) sometimes print 2 a couple of times. I guess it is because of the "noise" when button is pressed and that it should be debounced, but I don't know how to debounce analog pin. When you detect a significant difference in ADC reading, wait 20 milliseconds and then average a few readings then make a decision. If one of the readings still looks badly quantifiable, wait another short period of time. Since Andy didn't want to provide any code, I added some averaging when taking the ADC readings. So the averaging inside getButton accounts for any noise reading the analog line coming into the ADC, and the 50 ms delay takes care of detecting switch bounce. 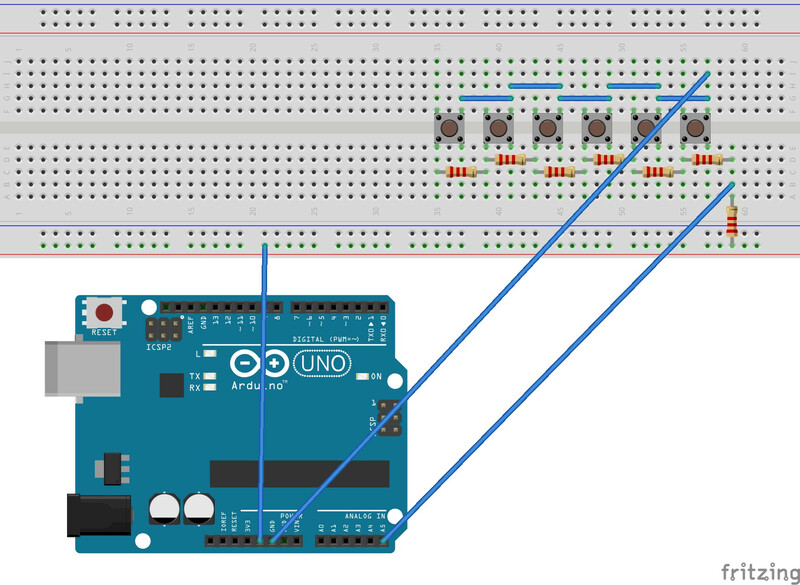 I have just recently started working with Arduino, and whilst this is an old question, I found this thread when trying to extend the number of buttons I could listen to. I worked from the original Fritzing illustration and produced a slight variant in both hardware and software. I modified the resistor set to use different values to try and produce a more consistent step between switches rather than the logarithmic steps produced by using the same resistors throughout. This produces steps of around 0.5V between each switch. I also built some basic software which looks for the same value for 3 readings in a row before acknowledging a change in voltage. This eliminates small variations in the reading. Obviously, the lastValues array could be made to whatever length you wanted - the longer the array, the longer a switch must be depressed to be detected. Many switches of the style you're using are hard to debounce well, and trying to use a resistive multiplexer won't make it easier. Still, if you can afford two port pins (one analog), I can offer a recipe for success which should work even if your switches are pretty lousy. I'd suggest moving the bus-bar resistor (ignore the bottom bus bar of the breadboard) to the left of your leftmost one, and wiring that to a the non-analog port pin. The common wire on the top should be connected to the analog port pin. The wire from the right-most resistor should connect to ground. When your unit is "idle" [you don't think any buttons are pushed] set the common output to high and float the other one. It will read low when no buttons are pushed, and will read close to VDD when any button is pushed. To find out which button is pushed, float the common wire and drive the left-side wire high. Briefly set the common wire high or low (see note) and float it again, then read the voltage on that pin a little while later (keeping the left-side wire high). Once the reading has been taken, you may if desired turn off power to the left-side wire (turn it on again before the next reading cycle). While a button is pushed, the voltage on the common wire should be a nice fraction of VDD (if there are six buttons and seven resistors, the buttons should read 1/7, 2/7, 3/7, etc. up to 6/7); the voltage should not be overly affected by whether the common pin had been briefly pulsed high or low. If no button is pushed, readings after the pin had been pulsed high will be much higher than when after it had been pulsed low. This will indicate that the button has been released. Once the button has been released, you may go back to the "idle" configuration. When the left resistor is driven high, the resistor string will draw current whether or not any buttons are pressed, but when the left pin is floated and the common wire is high, no current will be drawn until a button is pushed. To get good results with cheap switches, you should delay long enough after each momentary "ground" or "VDD" pulse on your common wire that if the switch is making any contact at all it will yield a good reading (try putting a 100K resistor in parallel with a switch, and adjust the delay and sensitivity so that it "barely" registers the switch as being held). Cheap switches have a resistance of well over a meg when totally released, and less than 10 ohms when fully pressed, but their resistance can wander all over the place between those states, and conventional debounce timing won't help. What will help is having a circuit that won't detect a button press until the resistance gets fairly low, and will regard a button as held unless its resistance gets much higher. For the circuit I've described, the left-side button will be more "sensitive" to "new" button pushes than the right-side button, and "hold" sensitivity may be different for all six buttons, but you should have little trouble ensuring that every button's "hold" sensitivity is much higher than its "new push" sensitivity, which is the requirement for reliable debouncing. Not the answer you're looking for? Browse other questions tagged arduino analog c programming microprocessor or ask your own question.